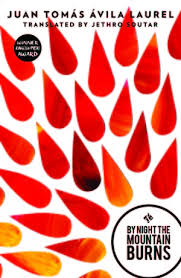 In an Independent Foreign Fiction Prize longlist dominated by European (one might even say German) literature, Juan Tomas Avila Laurel’s By Night the Mountain Burns offers something completely different. Laurel is a writer from Equatorial Guinea who now lives in Spain, and this is his first appearance in English, ably translated by Jethro Soutar. Soutar has spoken about how, although a translator’s job is to translate the book’s words, you also have to translate cultures, and this is particularly important when the novel is primarily designed to convey a way of life. The story, we are told, is the result of “white people” coming to the island to “recover our oral storytelling tradition” – presumably a criticism of the romantic expectations of Europeans. The island doesn’t so much have an oral storytelling tradition as a mishmash of superstitions and imported Catholic beliefs. The narrator’s childhood reveals a life of hardship where death is never far away, a story he tells with an unresolved ignorance that’s best exemplified when he talks of his grandfather. If you are expecting the novel to climax in an explanation, you will be disappointed: Laurel’s intention seems to be to demonstrate not so much the unknowable nature of the grandfather, but the limited experience of life on the island which makes comprehension of difference difficult. Laurel can certainly not be accused of painting a romantic picture of life on the island. Some of the most memorable sections of the narrative are the outbreak of cholera and the scene where a woman is beaten to death, despite appealing to the priest for help. In the latter, the circuitous nature of the storytelling works well: the incident is described as seen, and then later we learn what led up to it. By Night the Mountain Burns is what might be termed anthropological literature, the primary purpose being to transport the reader to an alien culture. Initially, I found the absence of both plot and character as we normally understand them frustrating, but on consideration, I feel that Laurel is deliberately undermining these expectations to convey the nature of life on the island. In this sense the novel’s form exactly matches its subject. You are currently browsing the archives for the Juan Tomas Avila Laurel category.